(1) I don't wear my dresses enough! Many Dressember dresses were dresses that have been hiding in my closet that have only gotten 1 or NO wears. I have a lot of dresses that I no longer wear because either I don't like them or they don't fit anymore. They're going to get donated or given to my little sisters. (2) Dressing up everyday makes me start my day earlier, so I'm more likely to be on time and more awake in the morning. I'm also better at managing my time. (3) Around the 10th day or so, I got a lot better at taking photos - posing, planning which shots I need, and whatnot. (4) It's fun to dress up. 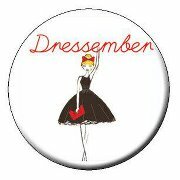 Did you do Dressember? What did you learn? You can see all my Dressember posts here, and you can check out the other Dressember particpants' dresses here. Will I do Dressember again? Hmmm...It was a LOT of work, and December is one of my busiest months. Of course, if all goes well, next year I will be a PhD candidate (right now I'm just a pre-candidate), which means no more classes! So, well see!